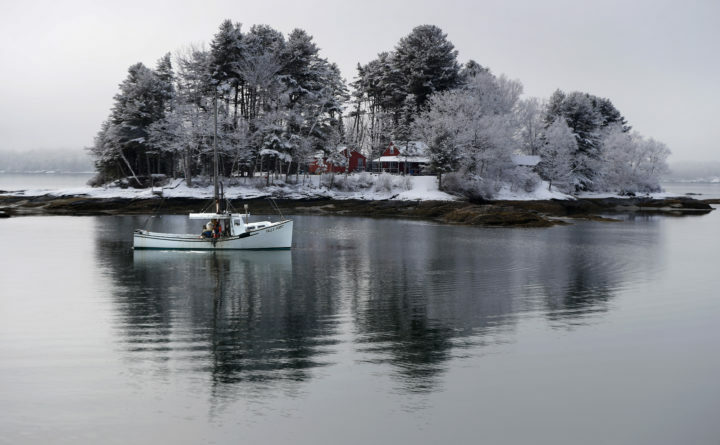 A lobsterman hauls a trap off Bowman Island where an overnight snowfall coats the trees, Thursday, March 14, 2019, in Freeport, Maine. Good morning. Temperatures will be in the high 30s to mid-40s from north to south. Workers have excavated a large hole at the intersection of Main and Railroad streets to replace the sewer infrastructure in that area with the eventual goal of stopping more sewage overflow from entering the Penobscot River as part of a consent decree with the DEP and EPA. 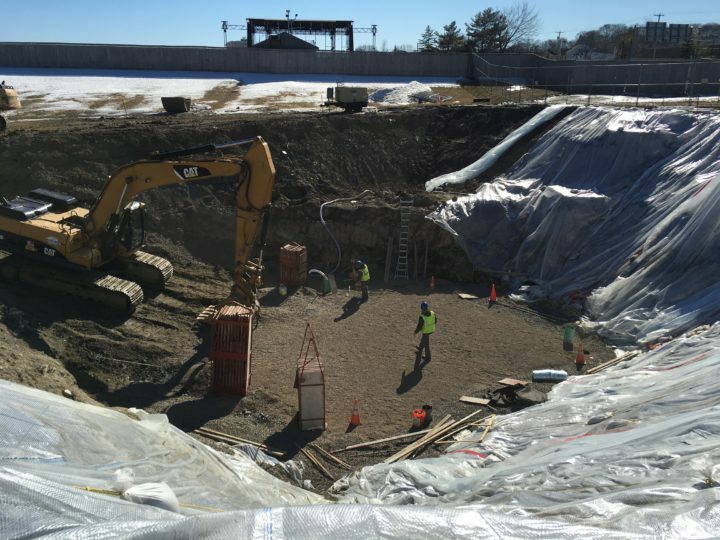 –As part of the first leg of the project to reduce the flow of raw sewage into the Penobscot River, workers have dug a large hole in the grassy area between the new Bangor Savings Bank campus and Darling’s Waterfront Pavilion on Main Street. The work will pause during the summer concert season. It’s part of Bangor’s efforts to comply with a 2015 agreement with the U.S. Environmental Protection Agency. –A second Ada’s Kitchen location — joining the flagship location in Rockland — will be opening on Congress Street in Portland this summer. It will serve casual Italian fare to eat in or take home. –The Maine House of Representatives initially approved a bill on Tuesday that would make the state join several others and a handful of municipalities including Bangor by recognizing the October holiday of Indigenous Peoples’ Day instead of Columbus Day. It faces further action in the House and Senate. 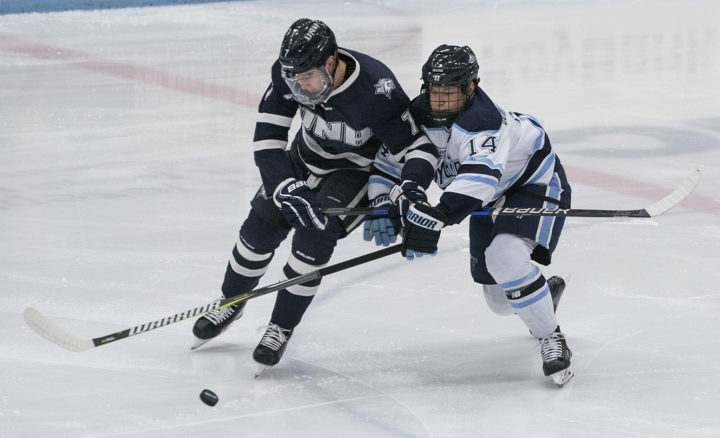 The University of Maine’s Jacob Schmidt-Svejstrup (right) and the University of New Hampshire’s Brendan Van Riemsdyk batle for the puck during the Jan. 21 game in at the Alfond Arena in Orono. 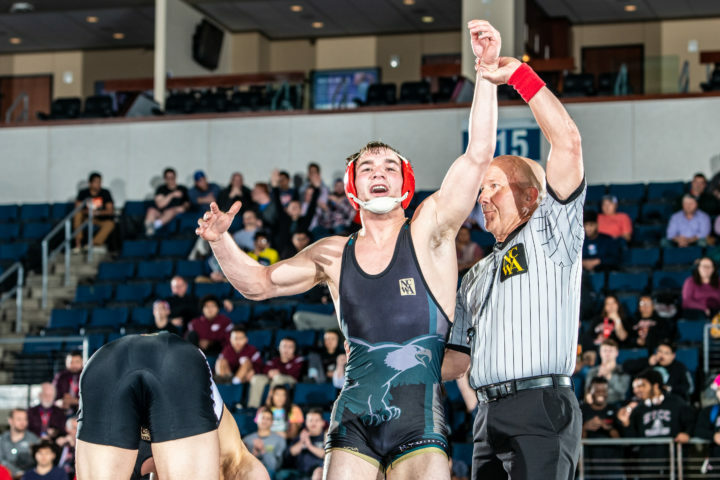 –A program that reached the NCAA Frozen Four six times in nine years between 1999 and 2007 hasn’t even advanced to the Hockey East semifinals since 2012. The Black Bears have mustered only two winning seasons since 2012 and have lost nine consecutive Hockey East playoff road games. With the exception of penalty-killing (84.9 percent efficiency rate), there was not another aspect of their game that was consistent this season. –The Maine Seacoast Mission elementary school students on the islands it serves picked “Moonbeam” as the name of its interim outreach vessel. The group said the name won out over “Hope” and “Promineo.” The Sunbeam is getting a major overhaul. In its place, the Moonbeam will bring a nurse to island residents for visits as well as artists and performers. Do this: Tell Aislinn where she should hike next! –“Even though I’ve been writing about Maine hikes for 7.5 years, I haven’t even come close to walking every trail in the state. 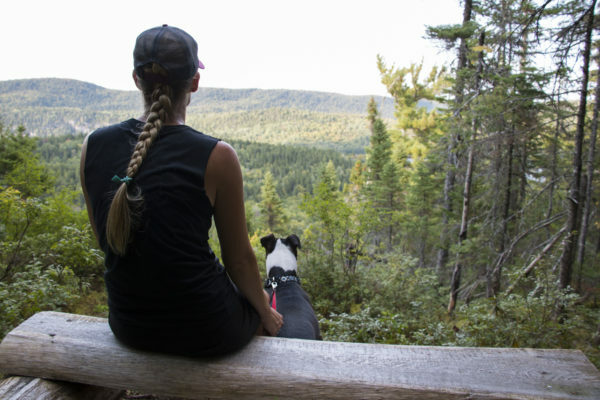 In fact, I have a long list of Maine trails that I haven’t hiked yet but aim to in the future,” writes BDN Outdoors reporter Aislinn Sarnacki. Help her build her list of outdoor adventures for the summer by recommending destinations. Maine’s minimum wage is working. Lawmakers shouldn’t weaken it.